It’s the last week of my holiday and I’ve started packing. 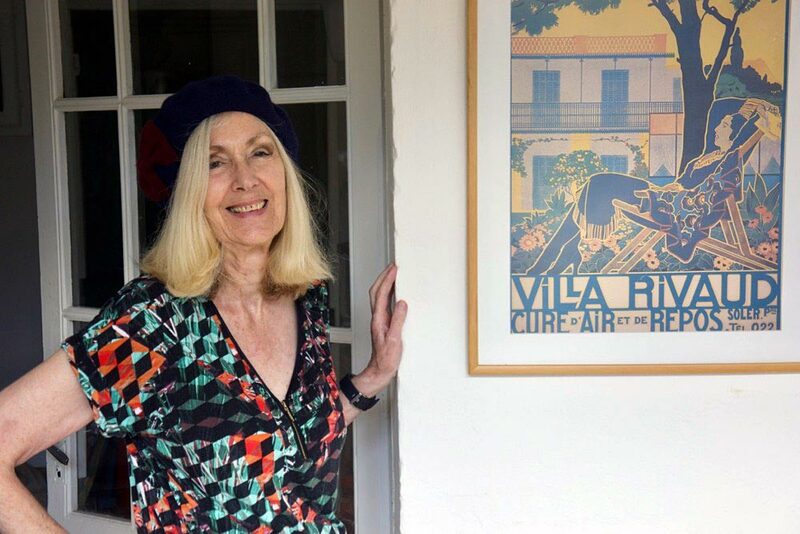 And I’m sorry to tell you that the hot weather clothes didn’t get much of an airing as it’s been one of those years when the weather in France has been quite cool and wet. Never mind, it’s still France and we’ve had a lovely time. I’ve also done a wee bit of clothes shopping, some of which was frugal and some not! More about the shopping in minute. 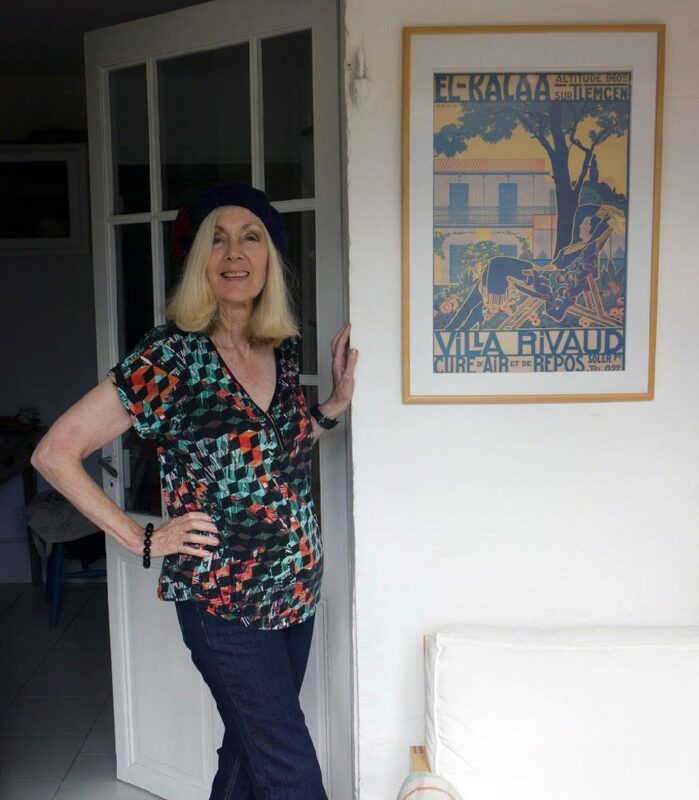 But first, I want to tell you about a blogging friend, June (who lives some of the time in France) who wrote a great blog (do have a look) on whether there is such a thing as a chic French style. Catherine of Atypical60 joined in the debate and the conclusion was that the idea of French ‘chic’ is blown all out of proportion. Here’s my view. What I noticed is that French women have a dress sense that is both simple and stylish. What I especially noticed was that I didn’t see one woman in a pair of black trousers and especially those that are wide and flappy. No, women of all sizes (seriously, all sizes) seem to wear skinny jeans that are slightly cropped. These are worn with a white plimsoll, sometimes with a short sock and sometimes without. They might then wear the ubiquitous striped top, plus a short Trench over that. But just like anywhere there are differences between country towns and cities. I saw a lot more women (of all sizes and all ages) wearing the skinny jeans in Toulouse than in the small town I spent much of my holiday. But it was definitely a ‘look’ that a lot of French women had and I admired its simplicity and style. To celebrate that look I bought a pair of jeans in Galeries Lafayette plus a beret. The beret’s navy and has a purple flower on the side. And the blotches on my arm are the remnants of mozzie bites. Mind you, what I’ve also noticed is that the price of clothes in France is phenomenally high. Those two items were Galeries Lafayette own brands (rather like buying Debenhams own brand) so they were much cheaper than many of the top-notch high-end brands in the store, but not as cheap as the same items would be in the UK. 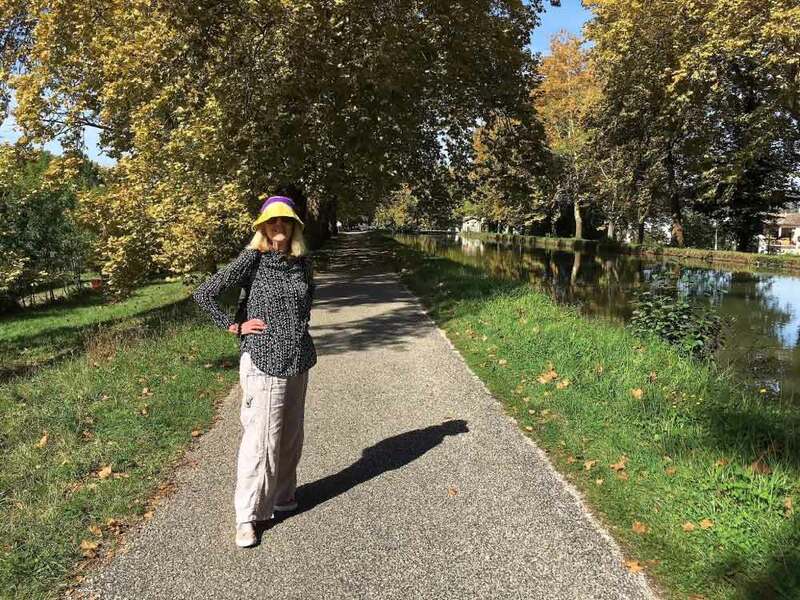 Then one day we travelled to quite a small village for their Sunday market (it was Limogne-en-Quercy) and I saw women (mainly older women) wearing clothes that had a great non-conformist almost hippy look, which I greatly admired. And there in the market square of Limogne I found a brocante (vintage/antique/junk) shop and bought two items of clothing. 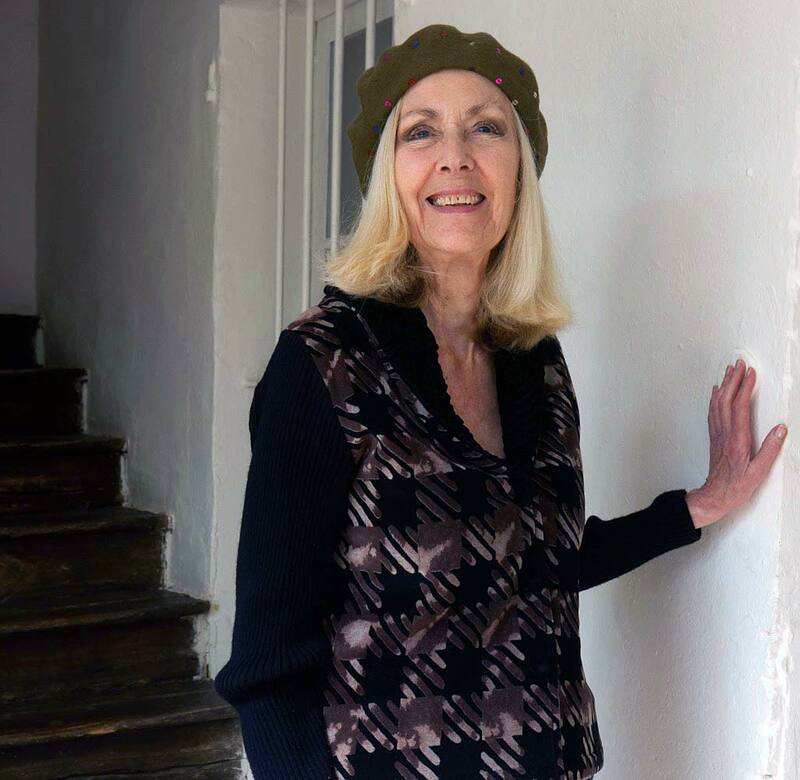 Well, one was a hat – another beret! And here they are. Can you see the sequins! And these items were not half the price of the jeans and navy beret, they were but a fraction of the cost (5 Euros for the hat and 6 Euros for the jacket). The jacket I totally love and will wear a lot this Autumn. You know, I’ll just have to visit that shop next year! Actually, I have so not been wearing stylish clothes on this holiday. I wore just one of my dresses (unlike last year it has not been all that hot). This was on one of the few hot days we’ve had. But mostly I’ve been wearing pale linen trousers (UK charity shop – £3) teamed with a long sleeved blouse (French charity shop – 3 Euros). It has been absolutely essential to cover up because of those pesky mozzies – must have had over 50 bites by now! As someone said to me, “c’est an annee exceptionelle“. Hmmm. Never mind, we’ve had lovely time. But back to Blighty at the end of the week. Nice! I just read both of your vacation posts. I’m glad you’ve had a great time pretty much “doing nothing”. Sometimes I think that is one of the best vacations to have. You can dress in anything and make it stylish. I noticed your backpack. We are going to the Grand Canyon next month for the first time and I have been hunting for a good secondhand backpack but haven’t come up with anything I really want for the price I want to pay. I am going to run over and read the french chic post because that has always interested me. I have quite a few berets and love them but I didn’t think they actually wear them in France anymore. What do you think? Recently back from a warm & mostly sunny Paris. Have to say that, these days, it seems that people tend to look and dress very much the same; certainly in the major European & US cities that I visit. Hardly surprising, since so many of the same shops and fashion brands everywhere. I can’t say I was overwhelmed by the sight of lots of chic French women. In my opinion, it’s in parts of London where you see the most fashionably, most expensively dressed women. But I do agree with your comment about the British propensity for the unflattering black trouser. I agree, it’s London, and also where I live, Brighton that has some really stylish women wearing amazing clothes. The idea that the French are ‘tres chic’ is a huge exaggeration of the reality of how French women actually dress. But what I did see was a ‘look’ which included skinny jeans coming in to the ankle, some cropped, some not, and very nearly all wearing a white plimsoll. I quite admired that look and not once did I see the wide black trousers which are so often worn by women in the UK. Although I believe that women should wear exactly what they want and not listen to fashion journalists, I really do believe that those black trousers are exactly as you say – unflattering. It has been warm and sunny here, btw, but only occasionally, and that warmth has brought out the mozzies which have been a real pain this holiday. Won’t miss those! Hi Penny!!!! June’s post was great, and I thank you for the mention on my blog too! But it’s so true. Gone are the days of spotting chic women throughout France unless you are on Avenue Foch in Paris. But it’s true. Those skinny jeans are flattering to every body type and the French ladies got that right!! I LOVE your berets. I LOVE them and it reminded me that I need to pick up a couple for the upcoming winter. Believe it or not, it’s hard to find a decent beret here in the States unless you are in New York City. And it’s true–the price of quality clothing in France is expensive that’s why those twice-yearly sales are so important. Galeries Lafayette’s brand does have some decent stuff–I picked up a small purse for Oona a few years back and she uses it constantly for date night with her boyfriend and for nights out. I love you hair longer, it looks fab!! AbFab!!! XOXOXOXOXOXO!!!! Hi Catherine (I’m off to your site shortly to comment on that makeup) Yes, the whole thing about French chic – was it true once? Now, it’s a huge myth, I think. Nevertheless I did like the look of those skinny jeans with the white plimsoll and I did admire the way women of all sizes wore those jeans – no straight or boyfriend jeans or those wide pants/trousers which only add inches. And oh, my, the price of clothes in this small town! One window in just a very ordinary shop had a very ordinary outfit of jeans, top and shoes, all for over 500 Euros – that is practically £500! It is slightly better in Toulouse and there were lots of lovely little shops with some great items but still too expensive for me. Galeries Lafayette would be equivalent to any of our big stores like Selfridges or even Debenhams. And their own brand stuff was the cheapest for clothes, but that would be cheap for France! Loved the store though and some of the high-end brands were to die for but I couldn’t stay window-shopping for long as my other half was getting so hot and bothered and bored – sigh! Interesting. When I used to visit the south of France, around the St Pons area, which admittedly is rather depressed, the elderly French women all seemed overweight and dressed in hideously unflattering pedal pushers and blue canvas slip ons, and at home they seemed to wear flowery housecoats. I can’t say I noticed the women in Toulouse or Paris looking particularly chic. I think Londoners dress a lot more stylishly and individually on the whole. I totally agree – this thing about French chic is a myth or at the very least a huge exaggeration. Was it ever true? 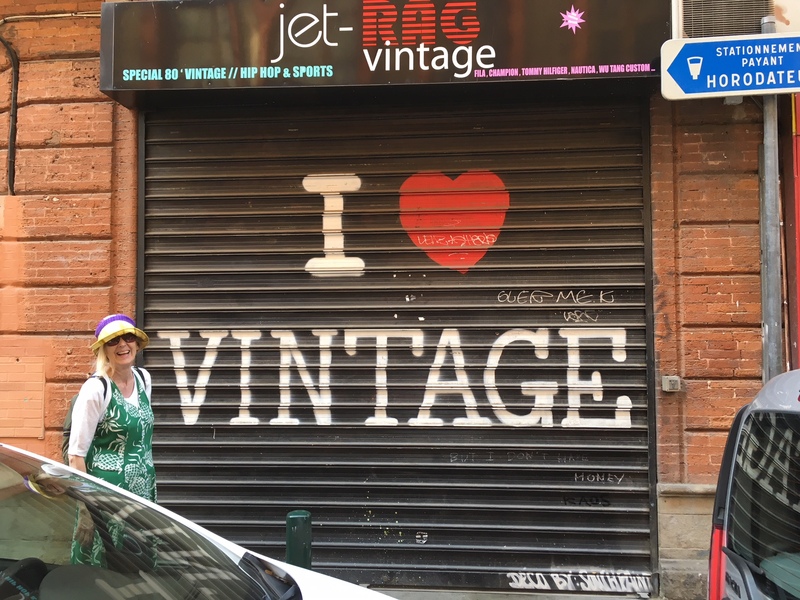 But as I’ve said in the other replies – there was definitely a ‘look’ in both this small town and the larger city of Toulouse of a pair of skinny jeans with a white plimsoll worn with a variety of tops. And there were NO large trousers or wide jeans – and women of all sizes wore these skinnies. I did admire that and thought it simple and in its own way – stylish. Very pleased to link up and also pleased to see you mending. I nearly fainted when you mentioned the cost of it all. Despite the common language our countries are so different. It wouldn’t have cost you one penny, if you’re a Brit, that is, as tourists do pay. But I would bet anything that a fractured wrist would not cost what it does in the States and that’s because despite all our beloved NHS’s problems it is still the most cost-effective (cheapest) system in the world. We Brits love our NHS, but sadly there has been a big element on the right (politics here) that want to emulate the US system – shame on them, I say, and actually so do a lot of other people. Anyway, Patti, enough of that. Good to see you’re better. Love that you got some great deals while vacationing!! pleased that you had a great holiday in France. Re the mosquito bites, I have been given a tip of a great product to use to deter the blighters. It’s Avon So Soft Dry Oil Spray. It smells delicious and leaves your skin soft and I am reliably informed that it is used by the Royal Marines and even the American forces. It’s on offer at the moment at £2.50 so why not give it a try? I have used it before going out into the garden, but unfortunately the spray went on the floor too, so best to apply it outside! But the flies etc stayed away, so I would say it works. I enjoy your blog and wish I found such bargains! You’re the third person to recommend this cream and from what I’ve read about it I shall definitely get it for other holidays. I couldn’t buy it here in France (I guess I could have got it sent over to France) so decided to tough it out. But yes, I’ll use the Avon spray next time. And the thing about the bargains is to always look in charity shops. But I often choose to walk out with nothing. It’s just looking and then pouncing when you see something. Good luck in your search! Hi June, well I thought the subject so fascinating. And really there is actually a French style that is different to the UK. I saw my first wide black trousers yesterday but most women were in skinny jeans – it’s so flattering to all sizes. And thanks about the hair – will do a post on this as I’m also growing out the colouring – will take 2 years in all to do that I think. Didn’t manage to get to the Indian but will aim to do that next time I’m in Toulouse which I loved. I’m in agreement that it’s a myth that chic, skinny, women abound in France. Certainly in rural France they look much like women anywhere else, I wrote a blog post about it a month or so ago. But yes, skinny jeans are everywhere and on all shapes. Clothes are madly expensive aren’t they? I’ve only bought one item this year…half price from SuperU! 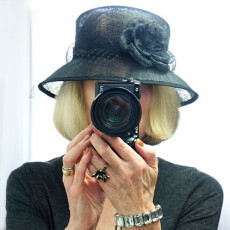 Love your berets, they are so flattering I find….especially on my pin head! Sorry to hear about your mozzie bites but I recommend that oil from Avon. You look great in a beret, which is no mean feat. Very stylish. The French are very minimalist really, which is why they look chic. Pared down. But they are slaves to rules, don’t you think, about not wearing this and not wearing that.